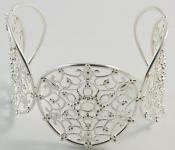 Think Cleopatra or Angelina when you slip on one of these regal cuffs. We have a range of different colored metals that is sure to meet anyone’s preference. Cuffs are great for those that find it hard to fit into bracelets. You can maneuver them to the smallest wrist or expand them to fit a larger wrist or even arm. Enjoy these versatile cuff bracelets. Cuff Bracelets are quickly becoming a fashion necessity in Hollywood. Celebrities from Alicia Keys to Micha Barton love showing off their latest cuff bracelet. Metal Cuff Bracelets are versatile and stylish. You can wear metal cuffs with jeans for a casual look or dress up your favorite dress. Cuff bracelets are the “in” fashion bracelet right now, and it’s really no wonder! They are classy but cool – and that means that when you wear them, you will be too! Cuff bracelets are the perfect accessory to any kind of outfit and they will compliment any kind of style. For instance, if you’re into looking bohemian chic, then wooden cuff bracelets can make you into a complete, naturalist princess – full of natural beauty. 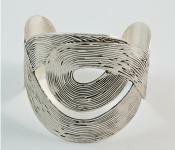 Metal cuffs are perfect for dressier occasions – or casual ones! Pair them with jeans and tanks tops. You’ll be at the height of chic, innovative style! Cuff bracelets are all the rage on runways around the world. Inspired by the Grecian beauties of the past, a stylish cuff bracelet is the perfect accessory to add to your outfit this season. Cuff bracelets are a great accessory to add to your closet because you never have to worry about matching them to your outfit and they're the hottest style in fashion jewelry. Available in a wide range of styles and colors, and all at such great prices, you can stock up on all of your favorites and find something to compliment every outfit in your closet. If you like o keep your style simple and elegant, try a basic metal cuff to take your outfit to the next level. 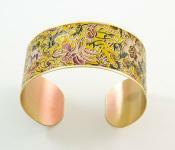 They metal design will make your wrist look thin and elegant, and it'll go with any outfit you may have in your closet. Cuff bracelets are perfect for the office or dressing up for a special occasion. As for that old adage about not mixing different metals? Throw it out the window! Cuff bracelets are meant to stand out and make a statement, while you shouldn't wear a ton of jewelry that may clash, a ring and simple necklace will add just the right balance and keep your outfit simple, classy and sophisticated. If you're inspired by intricate designs and want a fun and flirty look, try a cuff bracelet with pretty floral or geometric designs. These bracelets are perfect for the office and will allow you to look professional, classy and stylish all at once. 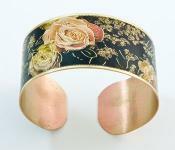 You can also be inspired by nature with cuffs in pretty floral or leaf designs. With these low prices, you can stock up on a few different styles to match any outfit in your closet. You can also get a fun and funky wood cuff to accent your outfit. Available in bold colors, these cuff bracelets are perfect for the girl who likes to add a little spice to her outfit and be noticed. Available in bold, bright colors, you can pair this accessory with a great, brightly hued shoe and you'll look instantly chic. The chunky design of the wood cuff bracelet is perfect for both summer and winter, and is a great casual cuff bracelet option for laid-back weekends in jeans in a t-shirt. The wood cuff bracelets also come in some of the season's hottest colors like deep orange, green and yellow. Available at such great prices, you can mix and match these fabulous cuff bracelets and experiment with the hottest colors and styles. A bright wood cuff and chunky necklace are the perfect boho-chic combo, and in the summer, pair them with a gladiator or other flat sandal for a look so stylish all your friends will want to borrow your look!